On Kickerstarter, there is an interesting kickerstarter for a new wireless/wired page turning pedal, the PageFlip Firefly. Looks like a great way to get one for cheap (probably like $20 off). They don’t ship until Feb 2014 though. I don’t have any experience with using these on an iPad, but I have been using a “classic” X-Keys pedal for about 6 years for my dual monitor teaching setup. It works great. A while ago, I wrote a post/rant about Aebersold pushing the Superscope Elevation software. Enough said about that. But I get these mailings from jazz books.com about sales, and they are still pushing these Superscope CD things that are like $999. Insane. 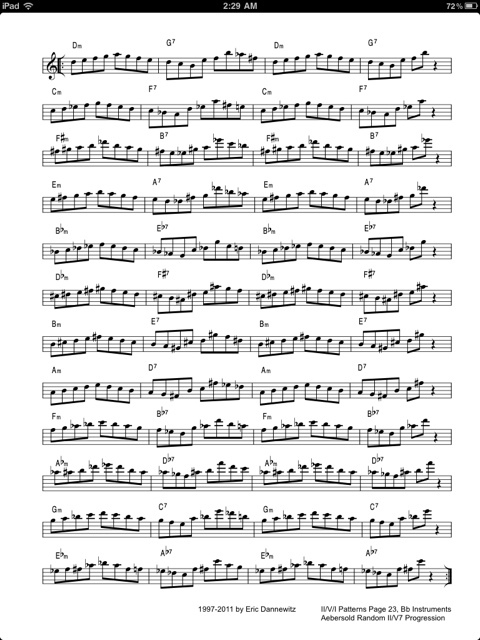 It makes me wonder WHY Jazzbooks/Aebersold has not embraced the digital age yet. The writing has been on the wall for about 2 years now that print media is a dying business. As is the making of CDs. Aebersold is running the risk of becoming like Kodak. So, how to change this? Here is what I would propose if I was in charge. First, offer digital versions of the catalog. The play-alongs, put them in Amazon and iTunes for $.99. 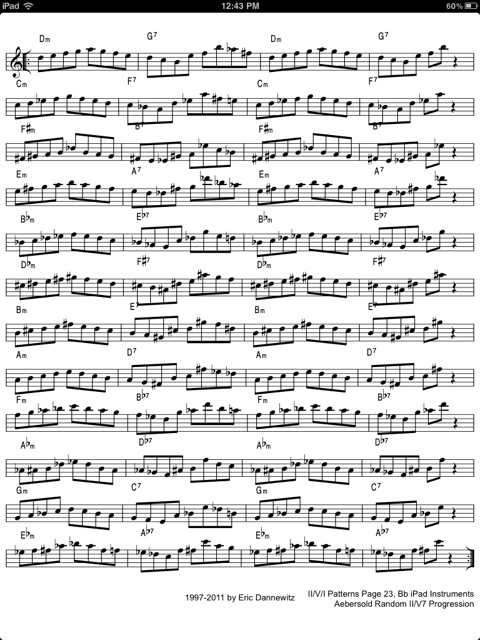 When someone buys the them that way, they also get the lead sheet in C/Eb/Bb/Bass clef. Would I put them out as tomes like they are now? No. What I would do is fully embrace technology and develop an App that would allow purchases of new songs within it. So, if someone ends up buying 100 songs that Aebersold produces, then they will be within the app, easily searchable, indexed, etc. You could just display the Eb versions, or whatever. 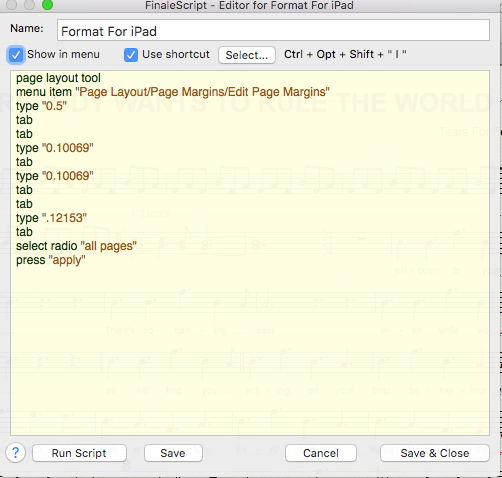 And allow annotations of the lead sheets (i.e. let people mark up the sheets if they want). The App would also have a slowdown function, and the ability to loop sections. Heck, some of the FREE slowdown things on the iPhone/iPad do this already. The ability to change the pitch would also be included, as would the ability to record what you are playing and the ability to hear just what you did, or you with the track. And you can mix it when you are playing back. And send it to like Garageband if you wanted. Or get it out of the App. The annotations that you did you could send via email, or print, or make a PDF. 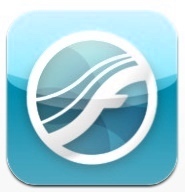 So, the base App would be free and include maybe a couple of freebee tracks to entice people. Then in-App purchases would be $.99 for a new song complete with Eb/Bb/C/Bass lead sheet. Ok, that takes care of the legacy Play-Alongs, but what about all the books that they publish. I’m not sure how they would do as EPUBs like in the iBook store. They might do better as a Textbook created with iAuthor. I would think that most of these could be make into PDFs fairly easily. Regardless, they need to be digital. PDF would be great, EPUB if possible, or maybe even an App for each book (like Greg Fishman’s stuff). Though, I would think that if they went the App per book route, they could use the engine that the play-alongs use. Then everything would be all together and you don’t end up with 30 apps for everything. I don’t know if Aebersold is planning this sort of thing, but they need to. All these sales emails has me concerned, and it just makes more sense. With the iPad continuing to be a huge hit……who wants to carry around huge books or Superscope devices when an iPad can all that and more…. There are a lot of interesting things announced at the NAMM show. Here are some of the ones I thought were interesting. 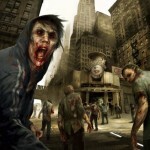 Technological Innovation, Seamless Integration The Apple iPad has opened a Pandora’s Box of opportunity for musicians. The iX docking station will send signal both two and from your iPad with a wide range of routing options. Tap into the hundreds of music apps including our own FX Processor that lets you dig deeper into your mic with top-notch EQs, studio-quality compressors and reverbs, plus a spectrum analyzer. With a wide variety to choose from in the app store, you can record to Garage Band, tune and monitor your rig through the room analyzer mic input, and more. The opportunities are endless. 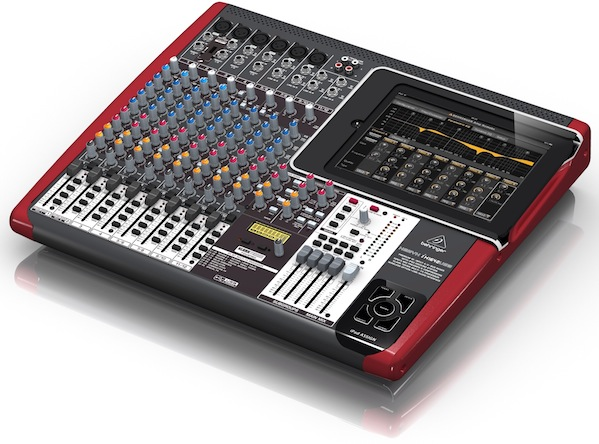 Wait, another iPad mixer thing……but from Mackie? With 16 boutique-quality Onyx mic preamps and the performance of 24bit Cirrus Logic® AD/DA converters, you have unparalleled sound quality. 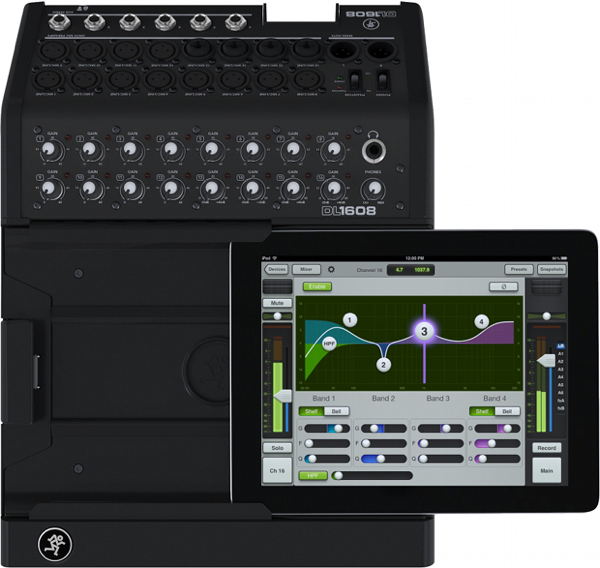 Seamless wired to wireless iPad control means you can mix from anywhere in the venue. This gives you the mobile freedom to control not only the mix, but powerful plug-ins like EQ, dynamics, effects and more. 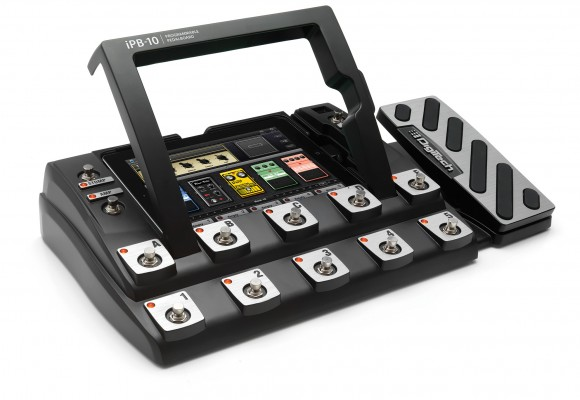 The sleek DL1608 even supports up to 10 iPad devices. Forget bulky consoles and racks of gear. The power is at your fingertips. Wait, wasn’t the iPad just a fad? Hmm…..
Apollo offers compatibility with Intel’s new Thunderbolt technology, as found on the newest iMacs, MacBook Pros, MacBook Airs, and next-generation PCs. Available via a user-installable dual-port Thunderbolt I/O Option Card (sold separately), Thunderbolt provides lower latency, reduced audio buffer size, improved performance, and greater UAD plug-in instances versus FireWire. 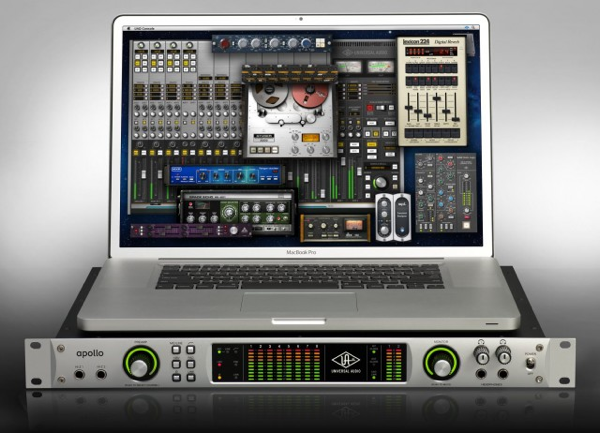 And because Thunderbolt offers many times the bandwith of FireWire, it allows music producers to connect numerous devices in series with the Apollo interface — including hard drives, processors, and additional computer monitors — all with fast, flawless performance. Connect Symphony I/O to any Thunderbolt™ equipped Mac for true Thunderbolt compatibility and performance. 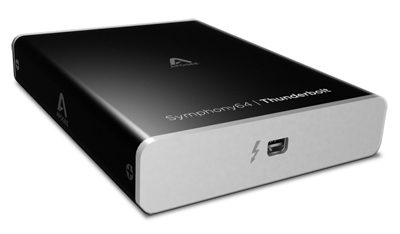 Symphony | 64 Thunderbolt will also connect X-Symphony equipped AD-16X, DA-16X, Rosetta 800 and Rosetta 200 converters to Thunderbolt Macs. I think this is where music is heading. Sure, there will be lots of people playing “traditional” instruments, but we will be a rare breed. “Before, during and even between classes at Hillbrook School this fall, seventh-graders have been spotted on the Los Gatos campus, sometimes burbling Spanish or Mandarin phrases into the glowing screen in their hands, other times staring into it like a looking glass,” Bruce Newman reports for The Mercury News. It just makes sense. It’s cheaper, more “green”, and more efficient. 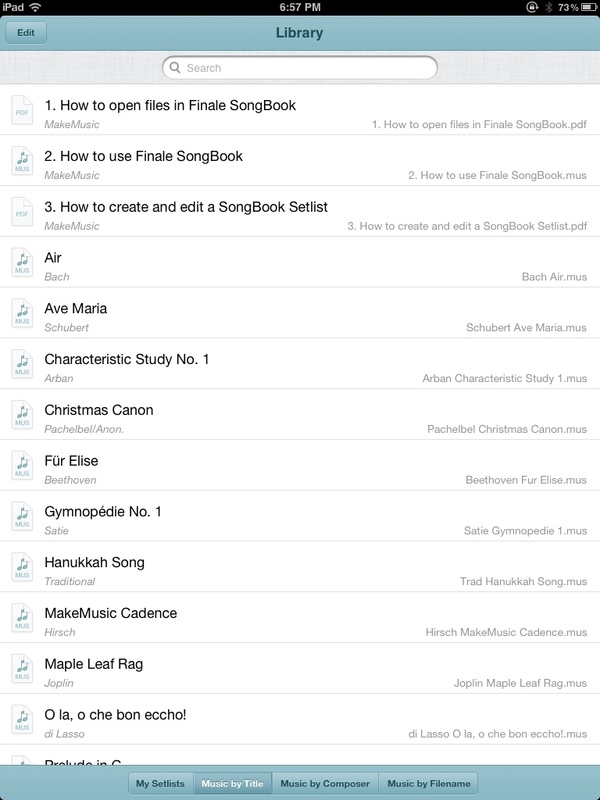 Now imagine having all your music books in an iPad. Or all that Lit and Analysis stuff accessible instantly. Or having some great ear training Apps to help with sight singing. 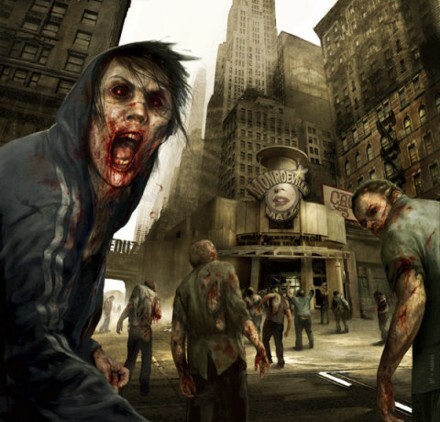 Soon……it’s happening as we speak….. Yes, the iPad is amazing. Ok, sure, there are some other makers coming out with devices too. Regardless of what you get, you are probably at some point going to want to convert some of your tattered books into digital format. But how? What should I use? Fear not, here are some guidelines to do it as I’ve converted quite a few of my old books that were falling apart into excellent PDFs. First, you need a scanner. A sheet feed scanner on something like a Brother 7340. I used a Brother 7420 myself, and it works great. Good Macintosh support. You could use a lot of other different solutions as well, but you really need to have a sheetfeeder scanner (ie: you can put 20+ pages on it and let it do it’s stuff). Second, you need some sort of paper cutter to cut the bindings off, and any books that are oversized (like Rubank) need to be trimmed a little to fit in the scanner’s sheetfeeder. You can use scissors I suppose, but a paper cutter is easier, cleaner, and does it better. For scanning, I’ve found that 300dpi B&W uncompressed TIFF is the way to go. I don’t do JPG or compressed TIFF because I am going to let the PDF part of the process do all the compression when I’m ready. I put in a stack of pages in the sheet feeder, and have it go. When its done, then I put the other side through the scanner. When that is all done, I go through the scans and number them (01…09….20….etc) and make sure that the scanner didn’t take two or more pages in by mistake (it will happen) and to see that they pages have all the stuff on the page (as in nothing was cut off during the scan). The cover and back I’ll generally use the flatbed scanner on the unit to make color scans. The covers are usually thicker anyways and don’t go through the feeder well (if at all). Ok, so, now you have all these TIFFs, I use Adobe Acrobat to assemble them (“Combine Files into PDF”). The middle setting (lower right filesize) is the setting I use, into a Single PDF file. You also need to make sure the pages are in order then go. Acrobat will then assemble all the files together, and display the result. Now, the next thing to do, which is why I use Acrobat, is to use the Tools->Recognize Text. Why you say? Well, it does OCR any text in the PDF, which is helpful if you need to search something, but it also will do things like straighten any crooked pages and stuff. Little things that will make your PDF look great. So run it. When it is done, then do an Apple-D and type in info for the PDF like the title, author, some key words. Then save.